Label: Rune Grammofon and Stickman Records. Over the last few years, the vibrant Norwegian music scene has been thriving, and some of the best music in Europe has been released by Norwegian bands. This includes Motorpsycho, who are, without doubt, one of Norway’s finest musical exports. The Motorpsycho story began in Trondheim, Norway, in 1989, and twenty-nine nine years later, they’re still going strong, and winning friends and influencing music lovers with their unique brand of genre-melting music. It’s more popular than ever, and in 2017, Motorpsycho the great survivors of Norwegian music enjoyed their sixteenth top ten album in Norway with The Tower, which was recently released by Rune Grammofon. That was quite a feat, considering Motorpsycho had been rocked by drummer Kenneth Kapstad’s announcement that he was leaving the band. While this was a huge blow for bassist Bent Sæther and guitarist and vocalist Hans Magnus Ryan who were two of the cofounders Motorpsycho in 1989. However, they had been here several times before, especially with drummers. Motorpsycho’s original drummer Kjell Runar Jenssen left in 1991, just two years after the band was founded. His replacement was Håkon Gebhardt, who joined in 1991 and was a member of Motorpsycho until 2005. By the time of Håkon Gebhardt’s departure, there had been three other changes to Motorpsycho’s lineup. Håkon Gebhardt had witnessed Lars Lieb and Helge “Deathprod” Sten depart in 1994. Since then, Deathprod has returned to the Motorpsycho fold and played on, and produced several albums. The next member of Motorpsycho ro depart was gguitarist and keyboardist Morten “Lolly” Fagervik in 1996. After that, the Motorpsycho lineup remained the same until 2005. However, when Håkon Gebhardt left Motorpsycho, replacing him proved problematic. It wasn’t until 2007 that Kenneth Kapstad was announced as Motorpsycho’s full-time drummer. At last, the band had found a drummer capable of filling Håkon Gebhardt’s shoes. Kenneth Kapstad went on to play an important part in the rise and rise of Motorpsycho until he announced his departure from the band in 2016. The big question on everyone’s lips was who would become Motorpsycho’s new drummer? In 2017, Tomas Järmyr became Motorpsycho’s fourth drummer in the band’s twenty-eight year history. Although Tomas Järmyr was just thirty, which was a good deal younger than bassist Bent Sæther and guitarist and vocalist Hans Magnus Ryan, Motorpsycho’s new drummer was vastly experienced. Tomas Järmyr was born in Sweden and had been playing the drums since he was two, and had been studying music since the age of seven. This was the start of a lifelong love affair with music, that lasted through high school, college and university. After graduating from university, Tomas Järmyr moved to Norway in 2008, and since 2011, has spent some of the time teaching at the jazz department at NTNU in Trondheim. The rest of the time Tomas Järmyr was a freelance drummer. However, in 2017 he was recruited by Motorpsycho and made his debut on The Tower. For most bands, entering the studio to record a new album with a newly recruited drummer could’ve given the rest of band some sleepless nights. Not Motorpsycho, who had been here before, and took it all in their stride. There was a reason for this. Bassist Bent Sæther and guitarist and vocalist Hans Magnus Ryan knew that Tomas Järmyr was the drummer they had been looking for, and could bring something new to Motorpsycho when recording of The Tower began. Before recording of The Tower began, the two remaining founding members of Motorpsycho wrote the ten tracks. Bassist Bent Sæther wrote A.S.F.E., Intrepid Explorer, Stardust, In Every Dream Home (There’s A Dream Of Something Else) and The Maypole. Bent Sæther and Hans Magnus Ryan wrote The Tower, Bartok Of The Universe, A Pacific Sonata (Including Malibu And Stunt Road), The Cuckoo and Ship Of Fools. These ten tracks became The Tower. Recording of The Tower took place at White Buffalo Studios in Los Angeles and at Rancho De La Luna recording studio in Joshua Tree, California. Bent Sæther took charge of production on The Tower, which marked the start of a new era for Motorpsycho. It was the first time drummer Tomas Järmyr, bassist Bent Sæther and guitarist and vocalist Hans Magnus Ryan had recorded together. They were joined Alain Johannes who played guitar on Intrepid Explorer and Intrepid Explorer; flute In Every Dream Home and added the vocal on A.S.F.E. Once the recording sessions were over, all that remained was some overdubbing that took place Beige Buffalo, Kommun’ and at Thomas Henriksen’s Supersound studio in Trondheim where it all began for Motorpsycho. With The Tower completed, Motorpsycho began working towards a release date later in 2017. When The Tower was released, it was to the same critical acclaim that had accompanied their last few albums. Things were looking good for Motorpsycho. When The Tower was released, it reached number three in Norway, which was Motorpsycho sixteenth top ten albums. Two of these albums, 2000s Let The Eat Cake and Phanerothyme in 2001 had topped the Norwegian charts. Sixteen years on, and Motorpsycho was regarded as musical royalty in Norway. Elsewhere in Europe, and as far afield as North America, Motorpsycho had never been more popular. No wonder, when they could release albums of the quality of The Tower. Opening The Tower, and a new era for Motorpsycho, is the title-track, with its dreamy mellotron introduction that brings back memories of fairground rides. Not for long, as soon, Motorpsycho cut loose and embark upon a three-pronged attack. The powerhouse of a rhythm section providing the backdrop for blistering guitar riffs, as the new lineup of Motorpsycho showcase their skills before the arrangement becomes choppy, rocky and melodic. Meanwhile, Hans Magnus Ryan’s vocal is reminiscent of Yes’ Jon Anderson as a rocky anthem unfolds. Later, the tempo drops and the arrangement becomes spartan, and soon, progressive. There’s more than a nod to early King Crimson before Motorpsycho strut their way through the rest of track unleashing blistering guitar lines and incorporating elements progressive rock and even a hint of baroque rock. In doing so, they set the bar high for the rest of The Tower. Dark, dramatic and driving describes the über rocky and rousing Bartok Of The Universe, which sounds like a call to arms where Motorpsycho have been inspired by Iron Maiden and Judas Priest. Especially as scorching, searing, duelling guitars sit above the hard rocking rhythm section and later keyboards, while the vocal belts out this rousing battle hymn. It’s uplifting, memorable and hook-laden, and occasionally heads in the direction of baroque rock. Just when it seems Motorpsycho can’t rock any harder they unleash A.S.F.E., an urgent rocker where the rhythm section drive the arrangement along as machine gun guitar licks are unleashed. Meanwhile, Alain Johannes adds a swaggering vocal, and sings call and response with Motorpsycho. They’re men on a mission, fighting for their right to party at the end of the world. When the vocal drops out, crunch guitars are unleashed and the rhythm section never miss a beat. Then when Alain Johannes’ vocal returns, this breathtaking, propulsive and fist pumping anthem reveals the rest of its secrets. 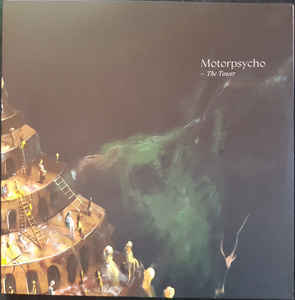 Motorpsycho toy with the listener on Intrepid Explorer as subtle chirping guitars and bass runs are joined by the tender lead vocal and tight harmonies. This is reminiscent of Queen, especially when a searing guitar cuts through the arrangement. Soon, a pulsating bass is joined by and Tomas Järmyr’s drums. His playing is crisp, fast, fluid and powerful as Motorpsycho stretch their legs and jam. In doing so, Motorpsycho show that they’re still the same band, and maybe even better with their new recruit onboard? By now, Motorpsycho is in full flight, and playing with a fluidity, invention and power as searing guitars soar above the rhythm section who underpin the arrangement. Later, pizzicato strings and the vocal returns, latterly, becoming jittery and otherworldly during this ten-minute musical epic. Stardust is very different from most of the tracks on The Tower, as it features a much more laid-back, mellow sound. The vocal is tender and heartfelt while an acoustic guitar, harmonies and lush strings play their part in a quite beautiful track that shows another side of Motorpsycho. Normal service is restored on the hard rocking In Every Dream Home (There’s A Dream Of Something Else). Blistering, driving guitars are unleashed as the rhythm section power the arrangement along. Initially, Hans Magnus Ryan’s vocal is much more restrained, but when the time comes he can deliver an impressive vocal powerhouse. He also unleashes one of his best guitar solos, and not to be outdone, Bent Sæther slaps at his bass playing with power and precision, and more than plays his part in the sound and success of the track. Later, when a flute enters this melodic rocker had become a bit more mellow and progressive. There’s a hint of Jethro Tull and later, West Coast rock, before guitars that veer between hard rock and fusion during Motorpsycho’s latest breathtaking magical mystery tour. A Pacific Sonata is a near sixteen minute epic, and for the first half of the track showcases the laid-back mellow sound that first featured in Stardust. It’s just Hans Magnus Ryan’s thoughtful vocal, acoustic guitar and harmonies and later, a chirping electric guitar that enters at 5.10 and is omnipresent for nearly two minutes. By then, the arrangement is starting to unfold, but still Motorpsycho eschew their trademark rocky sound. However, around 8.00 an atmospheric sound descends and the arrangement becomes progressive as it gallops along. Keyboards join with the rhythm section and guitar who lock into a groove as elements of progressive rock, Krautrock and free jazz combine as the arrangement becomes hypnotic, mesmeric and rocky as a jam unfolds. 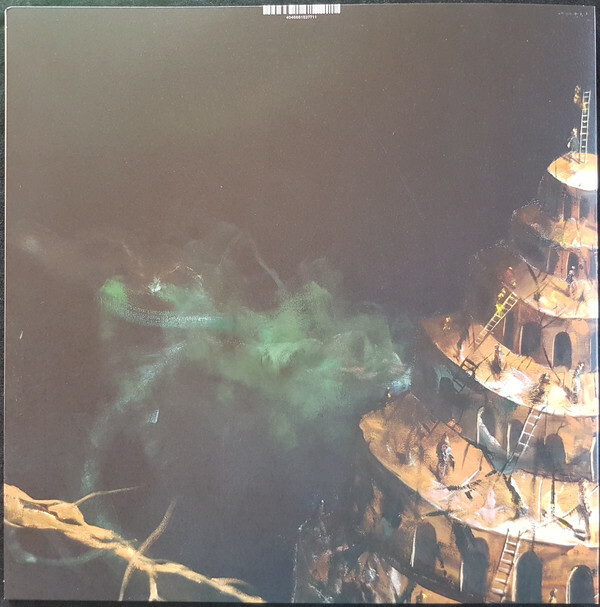 This is Motorpsycho at their most inventive and innovative as the drama and urgency builds on this Magnus Opus that is the centrepiece of The Power. Wistful describes the introduction to The Cuckoo, before the arrangement explodes into life, and the hard rocking Motorpsycho return. Blistering, machine gun licks are unleashed as the rhythm section power and drive the arrangement along. The final piece of the jigsaw is Hans Magnus Ryan, who sounds every inch the frontman to a hard rocking group like Motorpsycho. Especially on this progressive, rocky and melodic anthemic track. Midway through the track it’s strays into ballad territory, before becoming a fist pumping anthem that showcases the combined and considerable skills of Motorpsycho. Ship Of Fools closes The Tower and is a fifteen minute art rock epic. Right up until 1.39 bells-chime, before hard rocking Motorpsycho enter and play with a swagger. Duelling guitars and the powerhouse of a rhythm section combine with Hans Magnus Ryan’s vocal and cascading harmonies. What follows is a melodic, memorable and hard rocking slice of art rock this is cinematic and later progressive. Latterly, though, it’s full steam ahead for Motorpsycho who are determined to close The Tower on a high. They succeed in doing so, having kept one of their best tracks until last. Not for the first time, have Motorpsycho proven that the loss of a key band member doesn’t necessary mean it’s the end of the road for the Trondheim-based trio. They’ve survived six changes in personnel, including three drummers. This includes Kenneth Kapstad, who was part of since their golden period began in 2008. He’s been part of the rise and rise of Motorpsycho, and had played his part in transforming them into one Norway’s top bands. However, in 2016, Kenneth Kapstad called time on his career with Motorpsycho. This left a huge void, as drummers as good as there aren’t many drummers who could replace Kenneth Kapstad. It would’ve been easier to replace Ringo Starr from the “fab four,” who John Lennon said “isn’t even the best drummer in The Beatles.”With no sing of Paul McCartney waiting in the wings, the two remaining members of Motorpsycho began their search for a new drummer. Luckily, they discovered Tomas Järmyr, who turned out to be a ready-made replacement for Kenneth Kapstad. With thirty year old drummer Tomas Järmyr at the heart of Motorpsycho’s rhythm section, the Norwegian veterans enjoy what’s akin to a creative rebirth on The Tower, which continues a vintage period that began in 2008. Since then, Motorpsycho has released album after album that oozes quality. They’re in a rich vein of form which continues on The Tower. It’s an album that veers between Motorpsycho’s traditional hard rocking sound to a much more mellow, laid-back sound on a couple of songs. This is quite different to previous albums, on an album that incorporates elements of art rock, avant-garde, free jazz, Krautrock, progressive rock, psychedelia and rock. There’s even hints of experimental music and the West Coast sound on The Tower, which gave Motorpsycho their sixteenth top ten hit in their native Norway. That comes as no surprise as The Tower is an album of the highest quality. It’s an almost flawless from Motorpsycho, who seem to be reinvigorated since the addition of new drummer Tomas Järmyr, and the trio from Trondheim reach new heights on their latest carefully crafted, hard rocking album of innovative and genre-melting music, The Tower. It promises to be the start of a new and exciting chapter in Motorpsycho’s career.